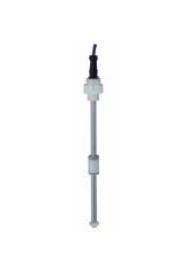 Level meter for a small tank that is chemical proof and corrosion resistant. Excellent chemical and corrosion resistance at temperature up to 100 degrees. Simple, low priced float type level meter. Low specific gravity super-small PP float and G1B screws are used. Ideal for a small tank. Can be used in various conditions including water-proof housings (protection class IP65), and heat resistant to 100 degrees. Integrated compact amplifier allows low price and easy wiring. This meter directly outputs the liquid level. It is a highly reliable product with CE approval. An RoHS model is optionally available. Continuously measures liquids in a small tank or small container. Ideal for replacing a conventional liquid level switch. Hash environments of extreme temperatures, and positions not easy to maintain or check.